Our Gift Guide wouldn’t be complete with out including the kiddies! So the Crusaders put together some of our top 10 cupcake themed gifts for kids! 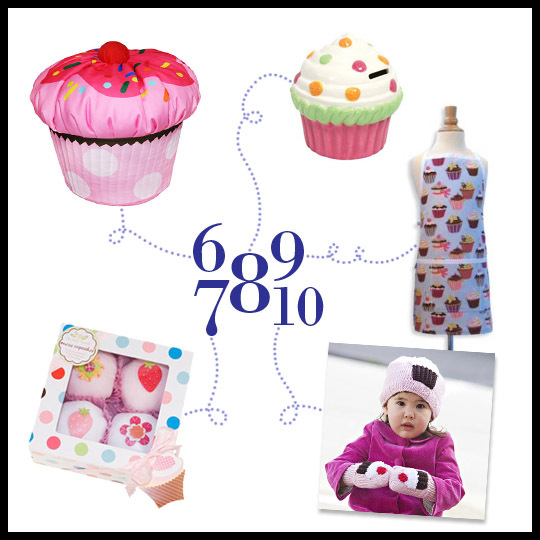 Broken into two categories: Toys and Kids Room, it covers all things cupcake for kids, from paint by number to beanbags! We hope this inspires you to think outside of the cupcake box this holiday season when shopping for the kids in your life. Enjoy! 1. Paint by Number – Cupcakes! $11.99 – Enjoy watching your child create a cupcake masterpiece with this fun and creative painting kit. The kits comes with real artists canvas acrylic paints, easy to follow instructions, and even an easy mount frame. It is non-toxic, and recommended for ages 8+. $15.39 – This fast-paced board game isn’t just fun, it’s also a great learning tool! With bright colors and fun shapes, kids will love playing this cupcake game. $6.99 – You R My Cupcake is an adorable, bite-sized, board book that’s filled with all the names we call our children: cutie pie, sweet pea, peanut, pumpkin. With bright colors and fantastic artwork this book is great for all ages. $19.99 (on sale as of 12/9/2011) – The perfect place for your little one to sit and enjoy a cupcake! This bean bag is bright, fun, and functional. Have your cake and sit on it too! A great addition to any kids room or play room. $12.99 – What a fun why to learn how to save money! This colorful cupcake bank by Stephan Baby is the perfect addition to your nursery or child’s room. The glossy finish and bright colors are sure to complement any décor. Stands 5″ tall. 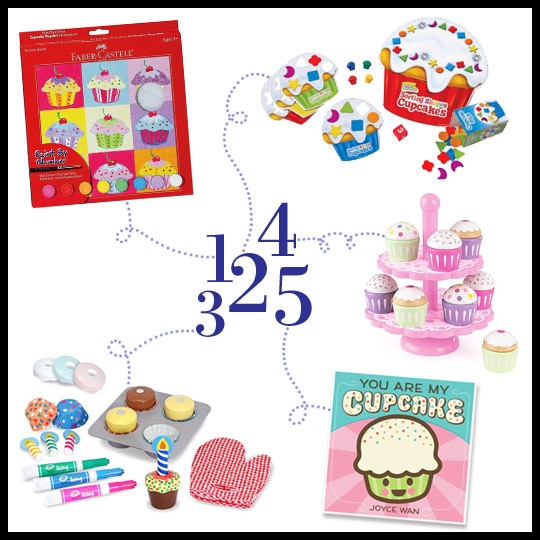 $24.00 – Perfect for your little baking helper! Made of 100% cotton and reversible, this apron will keep your little one’s clothes clean while they help you in the kitchen, paint, or even help you garden outside. What are some of your kids favorites? Have you found other kiddie cupcake items this holiday season? Share with us! This entry was posted in Cupcakes and tagged children, Cupcake, gift guide, kids, toys by Crusader Elisa. Bookmark the permalink.